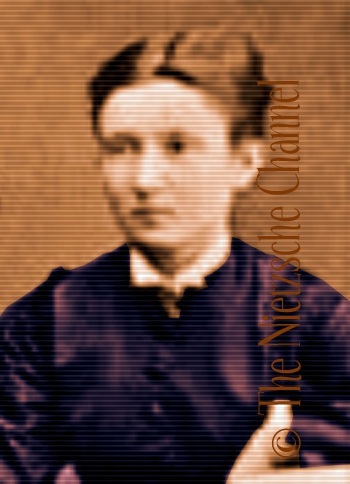 The Nietzsche Channel: Nietzsche's Letters. 1882. When I see you again, I will tell you some curious details — now a word about the possibilities of this "When I see you again." I am bound to Genoa by a work that here alone can come to an end because it has a Genoese character in itself — well, why should I not tell you? It is my "Dawn," conceived in 10 chapters and not merely in 5;3 and very much of what is in the first half is only the foundation and preparation of something more weighty, something more lofty (indeed! there are also some "dreadful things" that still need to be said, dear Frau Professor! ).4 In short, I do not know if I can fly north in the summer: but if I travel, I will come over to Basel and to your home. So you know what's going on between Herr Köselitz and me, and how I continue "to corrupt the youth" (— I will probably not escape the hemlock! ),9 I enclose the last letter10 of Herr Köselitz: it will perhaps cause some "astonishment" in you, but certainly no "shivers"! The weather the past few months was such that I had no objections to anything more beautiful and beneficial in my entire life — crisp, pure, mild: how many hours have I lain by the sea! How many times have I watched the sunset! Dear Frau Professor, "friends share everything in common" — say the Greeks:11 may life still give us* many things in common! — I thought as I read your letter. 1. End 1881: Letter from Elise Fincke. 2. 12-30-1881: Letter from Ida Overbeck. 3. 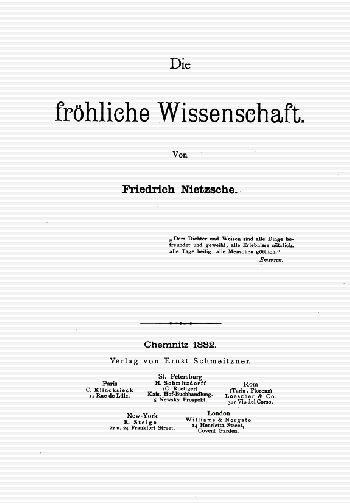 Nietzsche changed his plans to expand Morgenröthe (Dawn) from five chapters to ten, and instead used the material for Die fröhliche Wissenschaft (The Joyful Science). 4. An allusion to Nietzsche's concept of eternal recurrence. 5. For the premiere of Wagner's Parsifal. 6. Nietzsche's patron's certificate entitled him to a seat. 7. The comic opera by Heinrich Köselitz. 8. 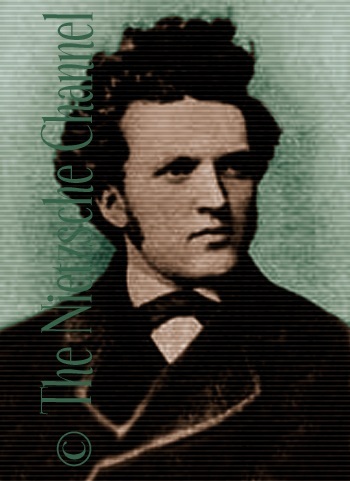 Nietzsche objected to the moralizing Christian content in Richard Wagner's Parsifal. 9. An allusion to the charges brought against Socrates, and his subsequent death by drinking hemlock. 10. 01-07-1882 letter from Heinrich Köselitz discussing Georges Bizet (1838-1875), French composer of the opera Carmen. On January 5, 1882, Nietzsche sent Köselitz a marked-up edition of Bizet's score, with 75 marginal notes in pencil. See "Nietzsche's Marginal Glosses to Georges Bizet's Carmen." In: Friedrich Nietzsche in Words and Pictures. Appendix 2. Chronology of Nietzsche's Music: 121-141. 11. A maxim by Pythagoras. See Diogenes Laertius, Lives of Eminent Philosophers, VIII, 1, 10. Cf. 05-29-1882: Letter to Paul Rée. 12. Namely, Nietzsche, and Franz and Ida Overbeck. Dear friend, Hr. von Bülow1 has the inherently bad manners of a Prussian officer, but is an "honest fellow" — that he no longer wants anything to do with German opera music is due to all kinds of secret reasons; it occurs to me that he once told me "I do not know Wagner's latest music." — Go to Bayreuth in the summer;2 there you will find all of Germany's theatrical people, and even Prince Lichtenstein,3 etc., likewise Levy [sic].4 I think all of my friends will be there, also my sister, after your letter of yesterday (and that pleases me very much!). Oh what days! Oh the wonders of this beautiful Januarius!6 Let us be of good cheer, dearest friend! 1. When Köselitz sent the score of his comic opera ("Scherz, List und Rache") to Hans von Bülow, it was summarily dismissed as fodder for the servile herd of Wagnerian acolytes. According to Köselitz, "[Bülow] hatte die ihm zugeschickte Partitur von 'Scherz, List und Rache' gar nicht angesehen und mir, dem Allegro-Musiker, gleichwohl einen Brief geschrieben, der erkennen ließ, daß er mich für einen der imitatores aus dem servum pecus Wagneri hielt. Sein Brief begann: 'R. W. ist ein Phänomen, — Phänomene machen keine Schule'. Ich dankte ihm für die nicht erbetene Auskunft über ein Phänomen R. W. und schickte ihm den Brief mit den Worten zurück, ich wisse meine Verehrung vor ihm nicht besser zu bezeugen, als indem ich seinen Brief als ungeschrieben betrachte. Nietzsche fand diese Behandlung des Falles 'ganz angemessen'." ([Bülow] did not even look at the score sent to him of "Scherz, List und Rache" and to me, the allegro-musician, he nonetheless wrote a letter, letting it be known that he thought I was one of the imitatores from the servum pecus Wagneri. His letter began: "R. W. is a phenomenon, and phenomena don't create schools." I thanked him for the unsolicited information about the R. W. phenomena and returned his letter to him, saying I know no better way to show my respect for him than to regard his letter as unwritten. Nietzsche found this treatment of the matter 'entirely appropriate'.") In 1872, Nietzsche was also the subject of Bülow's withering criticism. 2. For the premiere of Wagner's Parsifal. 3. Johann II, Prince of Liechtenstein (1840-1929). Köselitz made his acquaintance in Venice. 4. 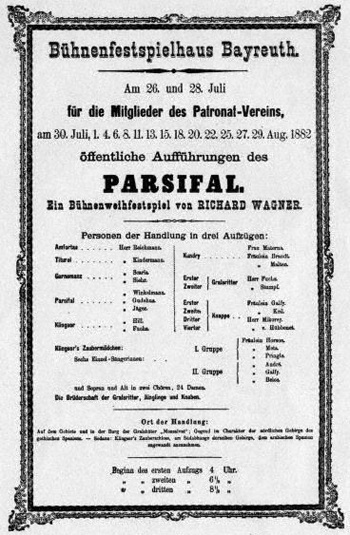 Hermann Levi (1839-1900) conducted the premiere of Parsifal in Bayreuth. 5. See the entry for Horace in Nietzsche's Library. 6. An allusion to the fourth book of The Joyful Science. Title page of Die Sonne sinkt. 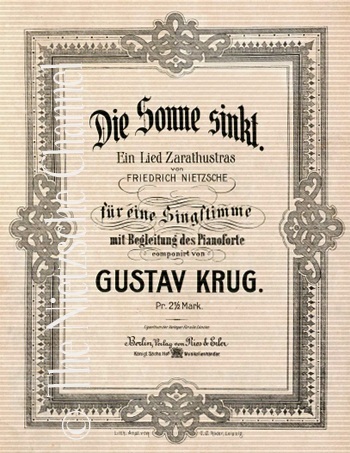 Ein Lied Zarathustras von Friedrich Nietzsche für eine Singstimme mit Begleitung des Pianoforte componirt von Gustav Krug. Berlin: Ries & Erler, n.d. [ca. 1901]. Typewritten letter to Gustav Krug. Your music has virtues which are rare at present —: I now consider all new modern music as suffering from an ever increasing atrophy of the sense of melody. Melody, as the ultimate and most sublime art of arts, has laws of logic, which our anarchists would like to decry as servitude —: I am certain that they are just incapable of reaching up to these sweetest and ripest of fruits. I recommend to all composers the most delightful asceticism: for a while to treat harmony as yet to be invented and to create collections of pure melodies, for example, from Beethoven and Chopin. — I hear much of the excellent past in your music and as you can see also a bit of the future. 1. "Jung Niklas fuhr auf's Meer." An 1865 ballad by Robert Radecke, text by Robert Reinick. No. 1. Mailied: "Wie herrlich leuchtet mir die Natur." No. 2. Wandrers Nachtlied: "Ueber allen Gipfeln ist Ruh." No. 3. Rückblick vom Berge: "Freud, o Freud." No. 4. Blumengruss: "Der Strauss den ich gepflücket." No. 5. "Jung Niklas fuhr auf's Meer." No. 6. Gefunden: "Ich ging im Walde so für mich hin." No. 7. Sehnsucht: "Das wird die letzte Thrän' nicht sein. Typewritten letter to Paul Rée. Your faithful friend F N.
No! I am going to send the letter to Frl. von M. to your address, dear friend. 1. 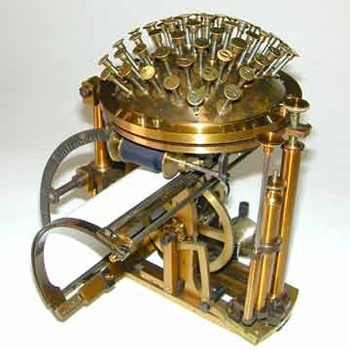 Read about the restoration of Nietzsche's typewriter by Eberwein. 2. His uncle, Theobald Oehler (1828-1881). 3. Rée was reimbursing him for a train ticket. 4. In this context, the closest English equivalent would be, "No kidding!" 5. 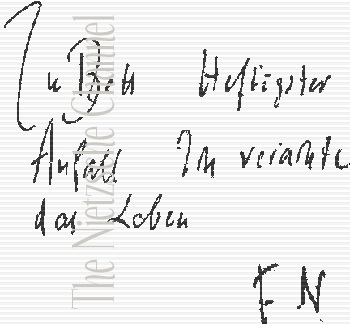 Overbeck sent Nietzsche his pension. 6. 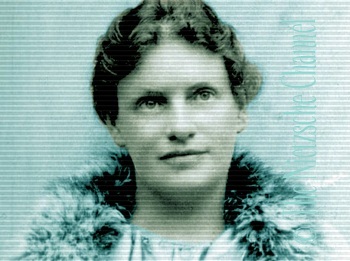 Lou Salomé, with whom Rée was in love, and in fact proposed to in March. 7. The idea to purchase Köselitz's score was probably Rée's, since Nietzsche was not on good terms with Carl von Gersdorff at the time. 8. See note 1 above. According to Eberwein, "the ribbon is torn and twisted with various kinks and folds." 9. Pieve di Cadore: birthplace of Titian. 10. This sentence was crossed out and replaced by the following one. When I'm all alone, I often, very often, say your name aloud — to my very great pleasure! 1. As a way of introduction to his closest friend. Franz Overbeck and his wife Ida were impressed with Salomé. Unfortunately, Overbeck's eight-page letter expressing these favorable sentiments is lost. 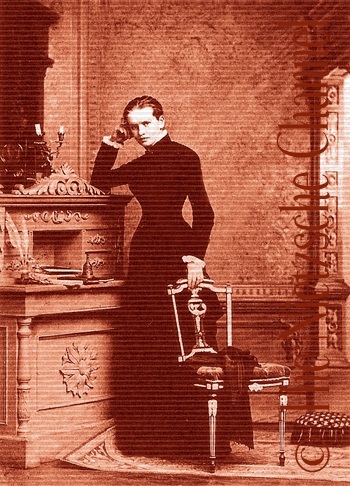 However, Ida Overbeck recorded her own observations on Salomé's visit of May 30 in her diary entry of June 2, 1882. 2. To avoid the disapproval of his family, especially his mother. At our last meeting1 I was all too exhausted: thus I left you and my friend2 in a state of worry and anxiety, for which actually no reason exists; rather reason enough for the opposite! At bottom, fate always strikes me as a blessing and at least one of wisdom — how could I fear fate particularly when it confronts me in the wholly unexpected form of L3? Meanwhile, I am feeling quite good; you will find that I have never been so cheerful in my life. What might be the reason for this? 4. 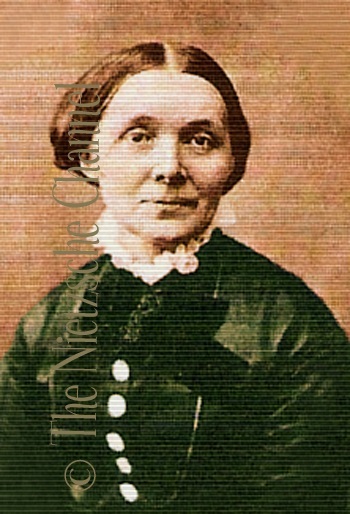 Jenny Rée (née Jonas, 1825-? ), the mother of Paul Rée. 6. 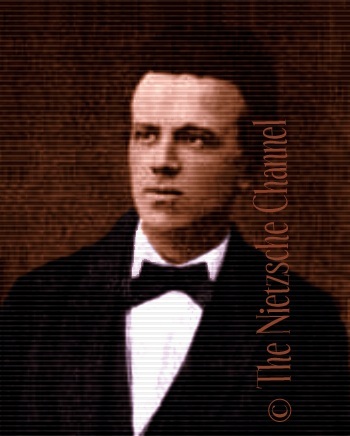 Franz Overbeck's eight-page letter about meeting Salomé is lost (in all likelihood, Elisabeth Nietzsche destroyed it), and only Nietzsche's reaction to it survives. 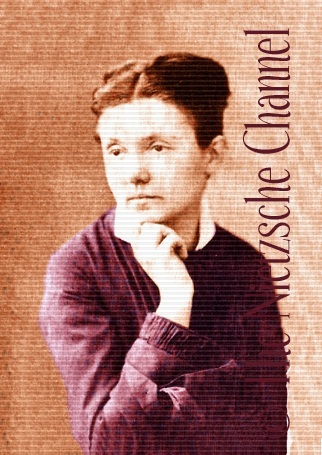 Lou Salomé, Paul Rée, Friedrich Nietzsche. Oh, that naughty photographer! And yet: what a lovely silhouette perches there on that delightful little cart!6 — We will spend the autumn, I think, in Vienna? Which performance do you want to be at in Bayreuth?7 Rée has a ticket for the first, as far as I know. — After Bayreuth, should we look for an intermediate place for the benefit of your health? Now is not the time to discuss my own. Heartfelt greetings Your F. N.
People say that never in my life have I been as cheerful as I am now. I trust in my destiny. 3. The forest west of Berlin. 4. To visit Paul Rée and his family. 5. To act as a chaperone. 6. Photograph by Jules Bonnet. 7. For the premiere of Wagner's Parsifal. I've been feeling fine, and I am cheerful and industrious. — The m[anu]s[cript] proves itself strangely "uneditable. "7 This stems from the principle of "mihi ipsi scribo. "8 — ! I often laugh about our Pythagorean friendship, with the very rare "filoiV panta koina. "9 It gives me a better conception of myself, to be truly capable of such a friendship.  But it remains amusing, doesn't it? Lots of love Your F. N.
Sincere greetings from me and my sister to your esteemed mother. 1. Their plan to live and work with Lou Salomé. 3. Rée's family home in West Prussia (now Zdbowo, Poland), where his father was a wealthy landowner. 4. Nietzsche was wary of disclosing his plans to his mother and sister. 6. Heinrich Romundt (1845-1919), his former housemate who left to become a Catholic priest, but soon dropped those plans and became a high-school teacher in Oldenburg. 7. The Joyful Science (illegible manuscript due to his handwriting). 8. "I write for myself." 9. "Friends share everything in common." A maxim by Pythagoras. See Diogenes Laertius, Lives of Eminent Philosophers, VIII, 1, 10. Cf. 01-19-1882: Letter to Ida Overbeck. and reproduced by Carl König, 1898. 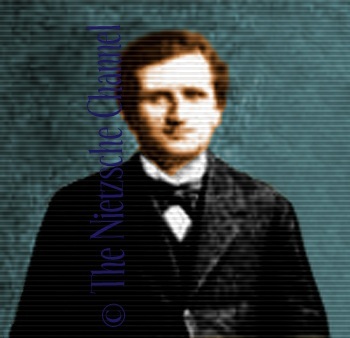 Colorized and enhanced image © The Nietzsche Channel. I trust that you will not take it quite amiss that I, an entire stranger to you, venture to intrude myself upon your notice when you are doubtless engrossed with your work and thoughts, or probably endeavouring to enjoy a short interval of leisure. I have nothing to offer by way of apology beyond a desire to express to you my most humble thanks for the benefit I have derived from your works, and the wish (which I have long entertained) to possess a likeness, be it ever so small, of the man I have learned to adore for the greatness of his mind and the sincerity of his utterances. I have several times tried to obtain through book agencies both here and abroad a photograph of your face, but I am sorry to say always in vain. Whether nothing of the kind exists I know not, but if such a thing is really to be had, I beg that you may put me in the way of obtaining it without regard to the matter of expense to me. 1 Your acquaintance as a writer I was fortunate enough to make some years ago when I was living in England, and I assure you I prize it no less than that of the great Schopenhauer himself, which thanks to my my brother2 in London I had made some years before my attention was first called to your "Inopportune reflections. "3 Being then engaged as a professional violin-player, I nevertheless found time enough to translate your pamphlet on Schopenhauer4 no less than three times, not so much with a view to publishing my feeble reproduction, as to that of becoming more intimate with your work and that of exercising myself in the use of the Queen's English. But in spite of my efforts, my version fell so far short of an adequate rendition of the original, that I was only too glad for the sake of your reputation to keep the manuscript in my desk. Since then I have quite destroyed it, but the memory of exalted moments remains, and I am sure that my work was at least not wasted upon myself. Although but an indifferent German scholar I nevertheless possess a sufficient knowledge of my mother tongue to read without effort and to grasp in the main the import of such writings as those of Schopenhauer, Wagner and yourself. That I have at least brains enough to enable me to perceive the true greatness of such men is at all events something, and compensates me in a measure for the want of such an education as would otherwise have enabled me to preach the gospel of thruth [sic] myself. My mind is only receptive, not productive, and I heartely [sic] wish ma[n]y others could convince themselves what folly it is for fools to "rush in where angels fear to tread"  then we should surely see less paper made unsaleable than is unfortunately the case now-a-days. Pray do not think it incumbent upon yourself to answer this, except it be to point out to me some work of yours which I have not yet in my possession. Those that I have include your "Geburt der Tragödie," "Inopportune reflections" and "Menschliches, Allzumenschliches." If there are any other writings from your pen which are published and you think are likely to interest a mere lover of good books, you will confer a favour, (for which you have my best thanks in anticipation) if you will call my attention to them so that I may add them to my little library. The coveted photograph I hope I may receive at your hands, but I shall feel no less grateful if you will only let me know where and in what way I may be able to obtain one. 1. 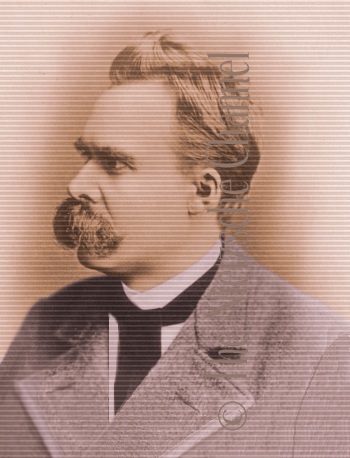 Nietzsche had a series of photographs taken in Naumburg in September and forwarded them to his publisher. 2. His brother Edward (1844-1905), a pianist, was a professor at London's Royal College of Music, and a friend of Richard Wagner. 2. His plan to live and work with Paul Rée and Lou Salomé. 4. Love of fate. Cf. The Joyful Science, §276: "I want to learn more and more to see as beautiful what is necessary in things; then I shall be one of those who make things beautiful. Amor fati: let that be my love henceforth! I do not want to wage war against what is ugly. I do not want to accuse; I do not even want to accuse those who accuse. Looking away shall be my only negation. And all in all and on the whole: some day I wish to be only a Yes-sayer! —." 6. Nietzsche was wary of disclosing his plans to his mother and sister. 7. Heinrich Romundt (1845-1919), their friend and former housemate who left to become a Catholic priest, but soon dropped those plans and became a high-school teacher in Oldenburg. Meanwhile, my dear dear friend, I was sick — indeed, I still am. Therefore today, too, just a few brief words! I think it is now apparent that Frl. Lou will be in Stibbe1 until the time of Bayreuth2 — anyway that she will remain with you and your mother until the specified date? Is this the correct understanding of the situation? How will she be transported to Bayreuth? Or does she deduce plans that perhaps lead southward (Engadine?)? I have noticed, unfortunately, that it is difficult for me to live incognito in Germany. I've given up on Thuringia altogether. I would like to hear as soon as possible what I have, and will be allowed, to do, so that I can have the summer at my disposal. Naumburg is a horrible place for my health. Address, dearest friend, your next lines to Leipzig, poste restante. Forgive this scribbling suffused with the spirit of sickness! In summa, both of us, after all, are doing very well; who has plans like us for such a lovely project? 1. To stay at the family home of Paul Rée. 3. Die fröhliche Wissenschaft (The Joyful Science) was finished on June 15, and published on September 10, 1882. 4. "I have written for myself." Witness secondly my trip to Berlin, in order to see L[ou] and the Grunewald; but I only achieved the latter — and I never want to see it again!2 The next day I returned to Naumburg — half-dead. — Also nothing of the projected stay in Leipzig; I only considered it for a day. In spite of everything I am full of confidence in this year and its enigmatic toss of the dice for my fate. I will not travel to Berchtesgaden and in general am no longer in any condition to undertake anything alone. In Berlin, I was like a lost penny that I myself had lost and thanks to my eyes was unable to find, although it lay right at my feet, so that all the passersby laughed. What about after Bayreuth? Now I join in that my mother could also extend an invitation to Frl. Lou, so that they could spend time around the month of August in Naumburg, and that we, in September, could make our way to Vienna. Please give your opinion. My greetings and thanks to your venerable mother — you indeed know why I owe her such a debt of gratitude right now. 1. Unknown letter from Rée. 2. In his mind, Salomé stood him up. Meanwhile, the Grunewald was crowded and disappointing. 3. For the premiere of Wagner's Parsifal. 4. Salomé was with Rée and his family in Stibbe. Accept my gratitude, dear friend! Everything will go well, just as you said. Heartiest greetings to our Rée! 1. Salomé agreed to come to Tautenburg after Bayreuth. 2. Nietzsche's printer in Leipzig. 3. Book 4 of The Joyful Science. 4. The plan to live and work in Vienna with Salomé and Rée. Today, a request and one that is a bit urgent! The Beautification Society here has erected two new benches in the parts of the woods where I like to walk by myself. I have promised to make and affix two plaques to them. Would you be so kind as to take care of this? And immediately? Talk about it with an expert on such things, what kind of plaque and inscription would last longest. 1. Printing of The Joyful Science. 2. Friedrich August Wenkel (1832-1894): chief pastor of the St. Wenzel church in Naumburg (1865-1894); and his daughter Susanne Wenkel (1866-?). 3. "Dead Man Woods": the old name of the part of the forest where he liked to walk. The name stems from the Thirty Years War. Lou Salomé, Max Heinemann, Paul Rée. Of prime necessity is life: a style should live. First, one must determine precisely "what-and-what do I wish to say and present" — before you may write. Writing must be mimicry. Since the writer lacks many of the speaker's means, he must in general have for his model a very expressive kind of presentation; of necessity, the written copy will appear much paler. The richness of life reveals itself through a richness of gestures. One must learn to feel everything — the length and retarding of sentences, interpunctuations, the choice of words, the pausing, the sequence of arguments — like gestures. Be careful with periods! Only those people who also have long duration of breath while speaking are entitled to periods. With most people, the period is a matter of affectation. Style ought to prove that one believes in an idea; not only thinks it but also feels it. The more abstract a truth which one wishes to teach, the more one must first seduce the senses. Strategy on the part of the good writer of prose consists of choosing his means for stepping close to poetry but never stepping into it. It is not good manners or clever to deprive one's reader of the most obvious objections. It is very good manners and very clever to leave it to one's reader alone to pronounce the ultimate quintessence of our wisdom. 1. Cf. Nachlass, Tautenburger Aufzeichnungen für Lou von Salomé. Juli-August 1882 1; . A slip of paper to Lou Salomé. In bed. The most terrible attack. I despise life. Sorry about yesterday! A terrible attack of my stupid headaches — today all gone. At 12 clock I will take you to Dornburg: — but before then I have to talk with you for about a half hour (soon, I means as soon as you get up). From b/w photo by Jacob Höflinger. The weeks in Tautenburg5 did me good, especially the last ones; and for the most part I have a right to talk of recovery, even though I am frequently reminded of the unstable equilibrium of my health. But, let the sky above me be clear! Otherwise I lose all too much time and strength! If you have read the Sanctus Januarius,6 then you will have noticed that I have passed a tropic. All that lies before me is new, and it will not be long before I get to see the terrifying face of my distant life-task. This long, rich summer was for me a testing time; I took leave of it very bravely and with pride, for I felt that during this time at least the otherwise so ugly chasm between willing and achievement had been bridged. There were hard demands made on my humanity, and I have grown equal to the most difficult situations. This entire intermediate state between what used to be and what will be, I call "in media vita";7 and the demon of music, which has haunted me again after many years, has compelled me to express this in tones8 as well. But the most useful thing I did this summer was talking with Lou. Our intellects and tastes are profoundly related — and there are, at the same time, so many differences that we are the most instructive objects and subjects of observation for one another. I have never gotten to know anyone who knows how to extract such an amount of objective insights from his experiences, anyone who knows how to draw so much from everything they have learned. Yesterday Rée wrote to me "Lou has definitely grown several inches in Tautenburg" — well, maybe I have too. I want to know whether there has ever existed such a philosophical candor like the one that exists between us. L[ou] is now completely engrossed in books and work; the greatest service that she has done me thus far, is to have persuaded Rée to recast9 his book10 on the basis of one of my main ideas. — Her health, I fear, will only last another 6-7 years. The heartiest greetings to Frau Rothpletz14 and her family! I have not yet thanked you for your cordial letter. 1. Nietzsche graduated from the University of Leipzig. 2. Tentative plans to spend time with Rée and Salomé in Leipzig. 3. Nietzsche objected to the moralizing Christian content in Richard Wagner's Parsifal. 4. Opera composed by Heinrich Köselitz. 5. August 7-26, 1882 with Lou Salomé. 6. Book 4 of The Joyful Science, with its prefatory poem, "Sanctus Januarius" (Saint Januarius): "Der du mit dem Flammenspeere / Meiner Seele Eis zertheilt, / Dass sie brausend nun zum Meere / Ihrer höchsten Hoffnung eilt: / Heller stets und stets gesunder, / Frei im liebevollsten Muss: — / Also preist sie deine Wunder, / Schönster Januarius! / Genua, January 1882." (You who with the flaming spear / Split the ice of my soul, / So that with a boom it now / Rushes to the sea of its highest hope: / Ever clearer and healthier, / In the most loving necessity still free: — / Thus it praises your wonders, / Fairest month of January! / Genoa, January 1882.) The title refers to the martyred saint whose vial of congealed blood purportedly becomes liquified once a year in January. 7. "in mid-life": the title of aphorism 324 in The Joyful Science. 8. In August 1882, Nietzsche composed for voice/piano "Gebet an das Leben" (Prayer to Life), Lou Salomé's poem ("Lebensgebet") set to an arrangement of his 1874 "Hymnus auf die Freundschaft" (Hymn to Friendship). See Friedrich Nietzsche in Words and Pictures. Appendix 2. Chronology of Nietzsche's Music: 25. 10. Paul Rée's Die Entstehung des Gewissens, was published in 1885. 11. See note 8 above. 13. The end of aphorism 342, and the conclusion of the first edition of The Joyful Science. 14. 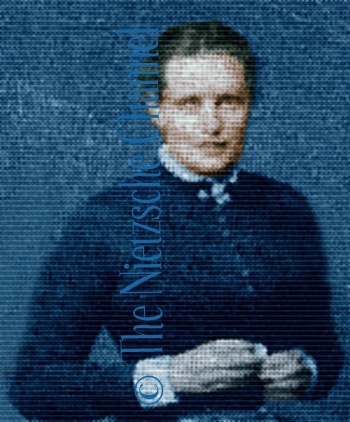 Louise Rothpletz, Overbeck's mother-in-law. Look at this picture2 and don't be startled: that's me. For a long time I have been looking for an opportunity to give you an indication of how often I have felt obliged and grateful to you — for many years now and recently more and more. The photographer sent pictures today; and the first one should have the honor to be dispatched to you, esteemed Frau. Your son Paul and [I], we have remained fond [of one another] for a good length of time,3 and now that our friendship has become a kind of trinity,4 we have one more reason to stay good friends with each other, to make life around our beloved third member5 a little more bearable and to give it a more dignified character. All the confidence you have shown us in this is something for which I feel the greatest respect: — I thank you with all my heart for it. 1. Jenny Rée (née Jonas, 1825-? ), the mother of Paul Rée. For a detailed summary of the Rée family, see Ruth Stummann-Bowert, Malwida von Meysenbug, Paul Ree. Briefe an einen Freund. Würzburg: Königshausen & Neumann, 1998, 67-72. 2. Nietzsche had a series of photographs taken in Naumburg in September. The picture shown here is probably the one Nietzsche sent. 3. Their friendship began in the spring of 1873. 4. 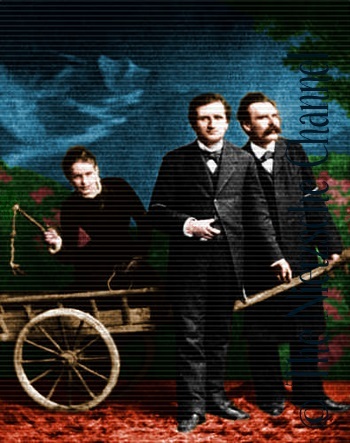 Nietzsche, Paul Rée, and Lou Salomé. Come very very soon to Leipzig! Why only on October 2? Adieu, my dear Lou! 1. Cf. Die Philosophie im tragischen Zeitalter der Griechen. 2. Cf. 09-13-1882 letter from Jacob Burckhardt. 3. 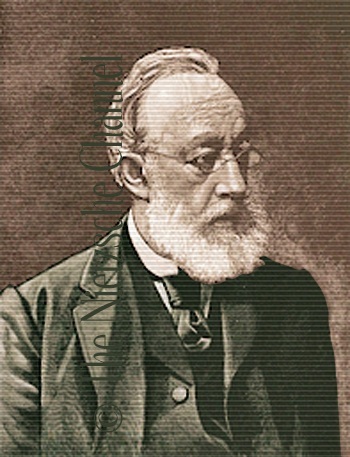 Carl Riedel (1827-1888): German conductor and composer. 4. In August 1882, Nietzsche composed for voice/piano "Gebet an das Leben" (Prayer to Life), Lou Salomé's poem ("Lebensgebet") set to an arrangement of his 1874 "Hymnus auf die Freundschaft" (Hymn to Friendship). See Friedrich Nietzsche in Words and Pictures. Appendix 2. 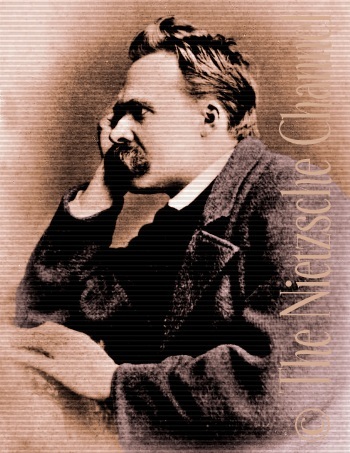 Chronology of Nietzsche's Music: 25. 6. Cf. John 18:38, "'What is truth?' said Pilate. With this he went out again to the Jews gathered there and said, 'I find no basis for a charge against him.'" 7. Carmen by Georges Bizet. 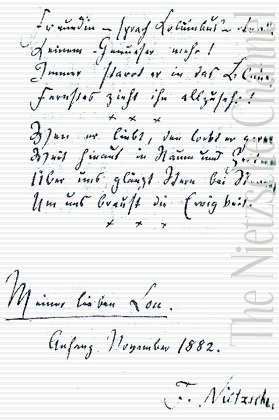 On January 5, 1882, Nietzsche sent Köselitz a marked-up edition of Bizet's score, with 75 marginal notes in pencil. See "Nietzsche's Marginal Glosses to Georges Bizet's Carmen." In: Friedrich Nietzsche in Words and Pictures. Appendix 2. Chronology of Nietzsche's Music: 121-141. 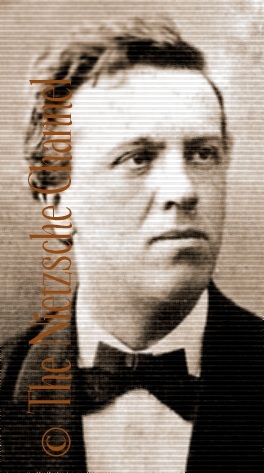 See Nietzsche's 11-28-1881 letter to Heinrich Köselitz. From b/w photo taken by Rudolf Ganz. I wish you already knew from somewhere or other that you are for me — a very highly esteemed person, man and poet. Then I wouldn't need to apologize today for having sent you a book2 recently. 1. Gottfried Keller (1819-1890): Swiss poet and writer. 4. The feeling wasn't exactly mutual, as we can see from Keller's correspondence and other material. In a November 18, 1873 letter to Emil Kuh, Keller gives his opinion of Nietzsche's first Untimely Meditation on David Strauss: "Das knäbische Pamphlet des Herrn Nietzsche gegen Strauss habe ich auch zu lesen begonnen, bringe es aber kaum zu Ende wegen des gar zu monotonen Schimpfstiles ohne alle positiven Leistungen oder Oasen." 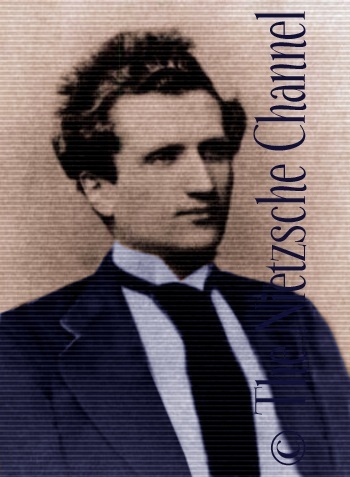 (I've also started to read the childish pamphlet of Mr. Nietzsche against Strauss, but can hardly finish it because of the all too monotonous abusive style without any constructive criticism or oases.) In addition, we have the personal observations of Robert Freund, a pianist and composer who studied under Franz Liszt. 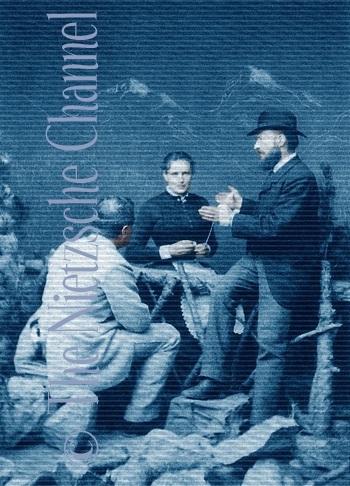 He recounts Nietzsche's meeting with Keller in September 1884: "Nietzsche, der Keller sehr verehrte, ihn aber noch nicht persönlich kannte, sagte mir einmal, daß er Keller am nächsten Vormittag besuchen werde. Nachdem der Besuch stattgefunden, ging ich am Nachmittag mit Nietzsche spazieren und frug ihn, wie es bei Keller gewesen sei. Es sei sehr nett gewesen, antwortete Nietzsche, nur entsetzte ihn das entsetzliche [sic] Deutsch, das Keller spreche und die mühsame Art, mit der sich der große Schriftsteller mündlich ausdrücke. Am nächsten Sonntag frug ich dann Keller, ob Herr Nietzsche ihn besucht habe. Keller bejahte und setzte hinzu: 'ich glaube, dä Kerl ischt verruckt.'" (Nietzsche, who greatly admired Keller, but still didn't know him personally, once told me that he would be going to Keller's the next morning. After the visit took place, I went for a walk with Nietzsche in the afternoon and asked him how it went with Keller. It was very nice, Nietzsche answered, only he was appalled by the terrible German that Keller spoke, and the laborious way the great writer expressed himself orally. The next Sunday, I asked Keller whether Herr Nietzsche had visited him. Keller said yes, and added: "I think the guy is crazy.") Cf. Robert Freund, "Memoiren eines Pianisten." In: Neujahrsblatt der Allgemeinen Musikgesellschaft. Bd. 139. Zürich: Hug, 1951. Is drawn out there too far! 1. Probably meant as a dedication to be tipped-in to her copy of The Joyful Science. See the 1884 version of this poem. Draft of a Letter to Paul Rée. I write this under clear skies: do not confuse my sanity with the nonsense of my recent opium-induced letter.1 I am not at all crazy and also do not suffer from delusions of grandeur. But I should have friends who will warn me at the right time of such dire affairs, like those of this summer. Or is it something else? The Lou in Orta was a different creature than the one whom I rediscovered later on. A creature without ideals, without goals, without duties, without shame. And on the lowest level of p[eople], despite her good mind! She told me herself that she had no morality — and I thought she had, like myself, a more severe morality than anybody! and she often sacrificed something of herself every day and every hour. In the meantime, I can only see that it is out of amusement and entertainment: and when I think that this also includes questions of morality, then, to put it mildly, I am seized with pure indignation. She has quite resented the fact that I denied her the right to the phrase "heroism of knowledge" — but she should be honest and say: "I am just worlds apart from that." While heroism is a matter of sacrifice and duty and in fact daily and hourly, and thus much more, the whole soul must be replete with one thing, and life and happiness indifferent about it. I thought I saw such a nature in L[ou]. Listen, friend, how I view the matter today! It is a complete disaster — and I am its victim. In the spring I thought I had found a person capable of helping me: which of course requires not only a good intell[ect] but a first-rate morality. Instead of this, we have discovered a creature who wants to amuse herself and is shameless enough to believe that the most distinguished minds on earth are just good enough for this purpose. I believed you had persuaded her to come to my aid. 1. See Rapallo, around December 20, 1882: Fragment of a Letter to Lou Salomé and Paul Rée. Whether you gave me joy or pain. The way a friend leaves his friend's breast. Mit ganzer Kraft umfaß ich Dich! Dein Rätsel tiefer nur ergründen. I hold you tight with all my strength! Probe your enigma ever deeper. Jahrtausende zu sein! zu denken! Wohlannoch hast Du Deine Pein. To live and think millennia! Well thenthere still remains your pain.